Like me, when most of the younger generation decide to choose which laptop to get either for work or school, they want what's trendy and stylish. The Apple Macbooks aren't exactly toys, they could do just about anything that the windows laptops can, only faster - plus getting a Mac means parting with a lot of your(or your folk's) hard earned cash so why not get it right the first time?! For starter's, there's no such thing as the average Macbook, it's price ranges from N200k to N600k and storage space ranges from 64GB to 1TB SSD. 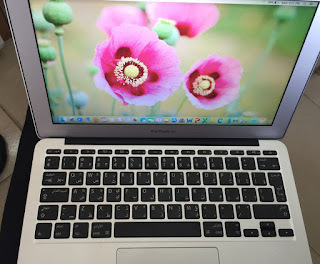 Used macbooks however, are usually priced at 60%-70% of the value of a new one. In the coming weeks, i would be discussing a lot about variety of options(New and Used), where to get the cheapest prices and how to spot a badly used/faulty Macbook. I would try as much as possible not to say too much at once. Something spectacular is about to happen later this month. It is the Holyfaze Comedy Hangout. Holyfaze is an OAP for Metro FM and a very crazy comedian. He has decided to gather some of the biggest names in the comedy industry for this awesome comedy show. Comedians like Klint d drunk, Ajebo and Gandoki to name a few as well as top musicians would be there to thrill the crowd. 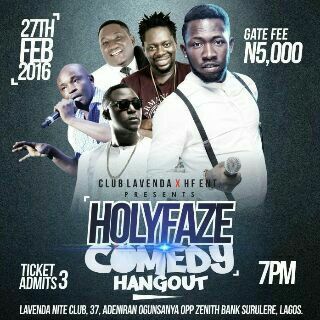 The show will take place on the 27th of February at Club Lavenda, 37, Adeniran Ogunsanya, Surulere, Lagos by 7pm. Gate fee is 5000 Naira. For bookings call 08021126090,08143066559. This is certified to be a comedy game changer, don't miss out!!!!!! !